Experts say we should make ½ our grains whole. But what exactly does that mean? As defined by the Oldways Whole Grains Council, whole grains “contain all the essential parts and naturally-occurring nutrients of the entire grain seed in their original proportions.” A whole grain is made up of three parts. The bran is the outer skin; the germ is the part of the grain that has the potential to grow into a new plant, the endosperm supplies energy to the rest of the grain. When thinking about grains, you may think of barley, corn, oats, and quinoa. However, there are many grains out there that are not as common like amaranth, millet, teff, triticale, and sorghum. Eating whole grains are good for you! They provide important nutrients such as fiber, vitamins and minerals; and a plant based diet focus with whole grains as part of a healthy eating pattern, has been shown to lower risk of heart disease, cancer, type 2 diabetes, and obesity. Although recommendations for grains vary based on factors such as age and activity level, the Dietary Guidelines for Americans recommend that adults get at least 6 servings of grains daily and at least half of the grains eaten should be whole grains (i.e., minimum 3 servings). General grain servings are 1 slice of bread, 1 cup of ready- to–eat cereal, or ½ cup of cooked cereal, pasta, or rice. The Whole Grain Stamps debuted in 2005 to help consumers quickly identify products containing whole grains. Updates were made to the basic Stamp design and currently, there are three different Whole Grain Stamps. Each Stamp identifies the amount of whole grain in a serving of the product. 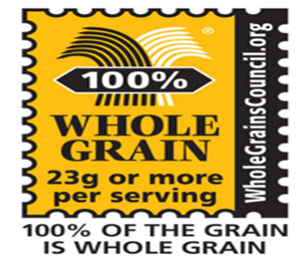 The 100% Stamp shown here is used for products to indicate that all the grain is whole and has at least 16 grams – a full serving- of whole grains based on the label serving.